It was on the 18th October 1962 that a small number of persons eager to enhance the propagation of German culture on the Island, accepted the invitation of Chev. Elias Zammit, M.B.E., K.M., then Consul General of the Federal Republic of Germany in Malta, to meet in his office, in what is today Republic Street in Valletta in order to form an Association with the aim of fostering better relations between the two nations. During this historic meeting, the members present, signed in the presence of the then German Ambassador for the United Kingdom, H.E. Dr. Hasso von Etsdorf, the Memorandum of Association, which gave formal and legal birth to the German-Maltese Circle. The members of this new Association, numbering then around 60 persons, started meeting regularly once a month in the office of the German Consulate in Valletta. Within a few months the first statute of the German-Maltese Circle was formulated and approved. Chev. Elias Zammit became the Circle’s first President, a post he held until 1965. In 1964, the German-Maltese Circle organised its first public activities with the visit to Malta of the Bielefeld Youth Chamber Choir and with an active participation during the official visit in Malta of the German Navy Frigates, the “Graf Spee” and the “Hipper”. Mr. John P. Pisani was the Circle’s second President between 1965 and 1969. In November 1966, the German-Maltese Circle rented a small flat in Scots Street, in Valletta, where the members used to meet once weekly. During that same year, the Circle’s Committee donated a collection of etchings on the Apocalypse by the famous German artist Albrecht Dürer to the Cathedral Museum in Mdina, where one can still admire it in what is commonly referred to as Dürer’s Hall. The first German language courses organised by the German-Maltese Circle for adults were launched in April 1967. For want of proper space and facilities, these courses were then held in the premises of the Old University Buildings in St. Paul’s Street, Valletta under the guidance of Rev. J. Milne, M.A., B.D. Following the course of some of the most hotly debated General Meetings in the history of the German-Maltese Circle, a new Statute was approved in December 1968. Through the assistance of the then German Ambassador to Malta, H.E. Dr. Karl Gustav Wollenweber, the German-Maltese Circle organised in November 1969 a grand concert with the participation of the famous German pianist Prof. Detlef Krauss. 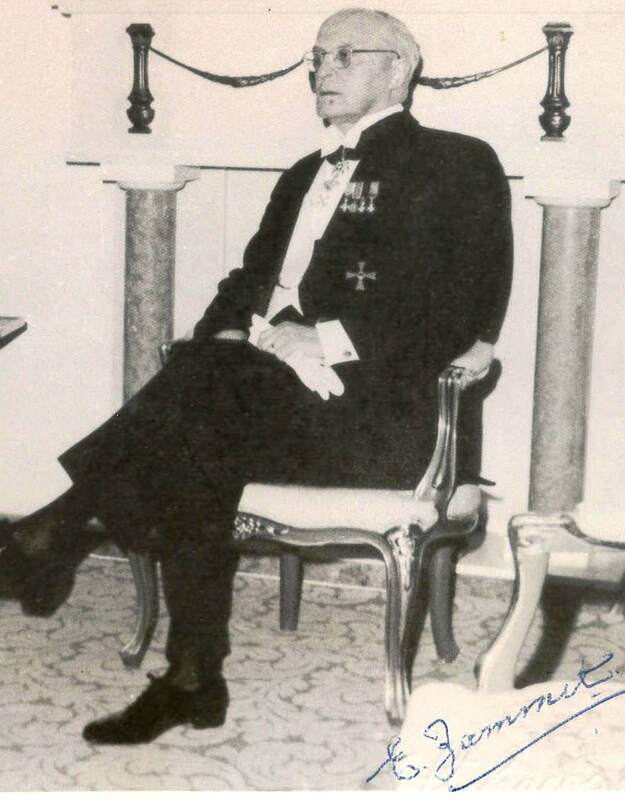 Dr Edwin L. Craig, M.D., was elected President of the German-Maltese Circle in 1969, to be followed in 1970 by Chev. Carmel Fenech. In November 1970, the German-Maltese Circle moved to a bigger flat situated in Gunlayer Street, Floriana. Amongst the activities which were organised to mark the official opening of this new premises, one can mention the Beethoven Exhibition, the concert by Prof. Ludwig Holscher and Prof. Karl Lautner and the planting of twenty-two trees in a part of Boschetto Gardens which part became henceforth known as the German Grove. In 1971, Professor Ralph Dahrendorf, then Under Secretary of State of the Federal Republic of Germany, paid an official visit to Malta. This visit turned out to be of utmost importance in establishing the German-Maltese Circle into the healthy Association we know today. On the initiative of the then German Ambassador, H.E. Baron York Alexander von Wendland, Professor Ralph Dahrendorf entered into discussions with the Circle’s officials. He soon realised the potential and the important role which the German-Maltese Circle could play towards fostering a healthy atmosphere in the field of good relations between Germany and Malta. Through his direct intervention arrangements were made so that, the Circle receives financial assistance from the Government of the Federal Republic which funds go towards the promotion of the German language and culture. It is worthwhile recalling here that in the period between 1965 and 1975, the German-Maltese Circle made quite a name for itself in the field of social entertaining and sports activities. These very popular activities which were organised on a very regular basis were most important in promoting the Circle’s name and objectives, thus increasing its membership numbers. With membership always on the increase, with a bigger demand for the German language and with the Circle’s Committee’s wish to involve itself much more in the organisation of cultural activities, the need arose for the Circle to find a more central and spacious premises. It was therefore with great joy and with a deep sense of satisfaction to all that on the 23rd May 1975, the German Ambassador, H.E. Herr Hans-Joachim Steinbach together with the Hon. Dr. Anton Buttigieg, then Deputy Prime Minister and Minister of Justice, and in the presence of many distinguished guests, officially opened Messina Palace in St. Christopher Street, Valletta as the German-Maltese Circle’s new premises. This majestic Palace, formerly known as Casa Rocca Grande, was built towards the end of the 16th Century by Fra Pietro La Rocca, Prior of Santo Stefano and later Admiral of the Fleet of the Order of St. John of Jerusalem. The number of cultural activities with the participation of Maltese and of German artists and personalities which were organised under the auspices of the German-Maltese Circle since then are too numerous and varied to be listed. Messina Palace has been the venue and has given a bigger and a more elegant dimension to the exhibitions, vocal and instrumental concerts, recitals, liederabends, lectures, forums, seminars and to all sorts of socio-cultural events organised or hosted there by the German-Maltese Circle. On the personal initiative of the German Ambassador H.E. Herr Kurt Schmidt, the German-Maltese Circle organised a Film Festival of German Opera in 1979. This proved to be one of the most successful landmarks in the Circle’s list of cultural events, with literally thousands of people from all walks of life crowding the Republic Hall at the Mediterranean Conference Centre in Valletta and the Catholic Institute in Floriana to watch these masterpieces on film. Between 1980 and 1987 the German-Maltese Circle sponsored German-Maltese Vocal and Instrumental Concerts at the Cathedral Museum in Mdina under the direction of Mro Joseph Vella. The main feature of these concerts was the premiere performance of a musical score by a composer whose works lay in the archives of the Mdina Cathedral Museum. These Concerts are considered as forming a vital part of Malta’s musical history. The International Certificate Conference (ICC), a European Association whose aims are those of co-ordinating the work of Adult Education Centres in the field of tutor training and in the area of a uniform certificate system held one of its conferences in Messina Palace in November 1985. The German-Maltese Circle was at that time a member of the ICC. Through its collaboration with the Goethe Institute, the German-Maltese Circle can guarantee professional standards in its German language courses besides being the only examination centre in Malta which offers the well-known Goethe Institute Certificates. 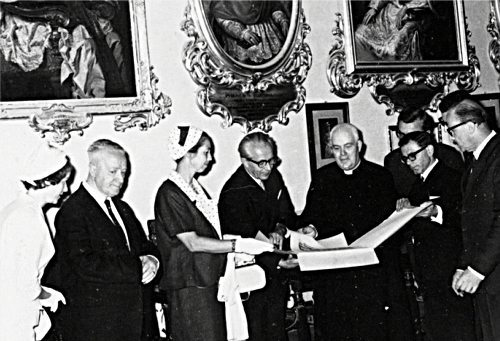 The Silver Jubilee Choral and Orchestral Concert with the participation of the Akkademja Chorus and Orchestra and of the Laudate Pueri Choir at the Cathedral Church in Mdina was the climax in a series of cultural events which were organised in 1987 under the Patronage of the then German Ambassador, H.E. Gottfried Pagenstert, a versatile personality who had great faith in the Association and who constantly worked towards enhancing the importance and popularity of the German-Maltese Circle not only locally but also in Germany. 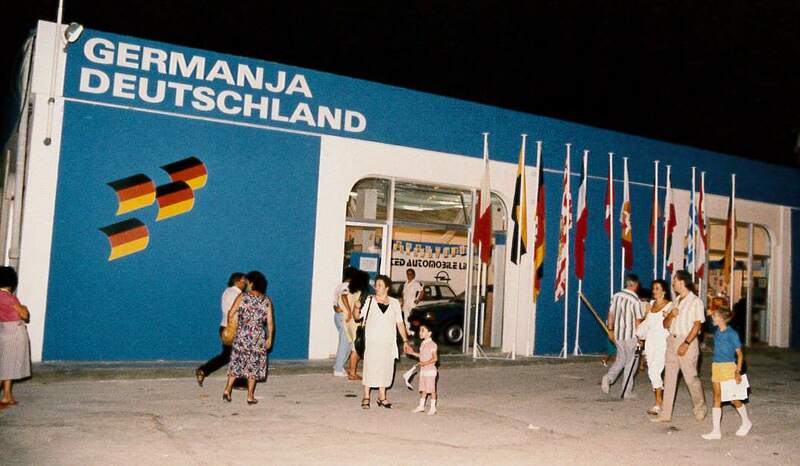 The German-Maltese Circle started organising in 1987 the German Pavilion at the International Trade Fair of Malta promoting Germany as Malta’s largest trading partner – an event which has continued annually till 2002. An unprecedented decision by the Federal Government led to the German-Maltese Circle to acquire its own premises in 1989. The Federal Government in fact financed the purchase of Messina Palace which henceforth became the property of the Circle. Forty Years Federal Republic of Germany and twenty-five years of diplomatic relations between Germany and Malta in 1989 and in 1990 respectively, were two events commemorated by the Circle through the organisation of a varied programme of activities with the participation of Maltese and German personalities. 1990 also saw the visit to Messina Palace of the first President of a United Germany, H.E. Dr Richard von Weizsäcker. During that same year Deutsche Welle presented to the German-Maltese Circle a satellite TV reception system, while a group of a hundred youths from the former East Berlin were brought to Malta for a cultural visit with the assistance of the German-Maltese Circle. Another big success was registered with a German Music Week organised in 1998 under the patronage of H.E. Mr Gerhard Kunz who had replaced H.E. Dr Martin Florin as Ambassador of the Federal Republic in Malta. The highlight of this Week was a concert at St John’s Co-Cathedral in Valletta by the Konstanzer Kammerchor which attracted an audience of over 700. The German-Maltese Circle celebrated the 250th Anniversary of Goethe’s birth with the theatrical production of “Faust” at the Malta Drydocks in 1999. 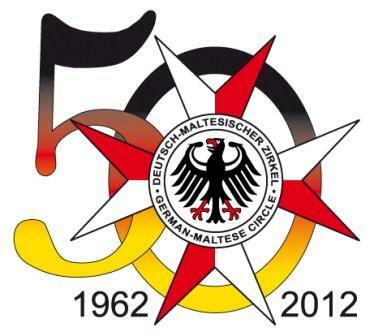 The year 2000 saw the launching of the German-Maltese Circle on the Internet. During that same year the Circle celebrated its 38th Anniversary with the performance of Mendelsshon’s Oratorio “Paulus” at St John’s Co-Cathedral in Valletta with the participation of the Swabian Concert Chorus and the Malta National Orchestra. In 2001, H.E. Mr Georg Merten became Germany’s Ambassador to Malta while Mr Albert Friggieri was elected as the new President of the German-Maltese Circle. That same year, the Circle together with other European Cultural Centres represented on the Island, organised ILSNA – a musico-literary evening dedicated to the European Year of Languages (EYL) at the Nicolo Isouard Hall of the Manoel Theatre. The EYL was also the theme for a Poster and Essay Competition organised by the German-Maltese Circle. Hundreds of schoolchildren from all over Malta and Gozo submitted colourful posters for this Competition. The year 2001 also saw the introduction of German language courses for schoolchildren at Messina Palace. The fortieth Anniversary since the foundation of the German-Maltese Circle in 2002 was characterised by the many cultural events organised throughout the year amongst which was the contemporary dance production “Into the Blue” by the Jan Pusch Dance Company which performance took place at the Manoel Theatre. In January 2005 the German-Maltese Circle became a “Kulturgesellschaft des Goethe Instituts” (a Cultural Association of the Goethe Institute). Also that year, the Circle brought over the Compagnie Fredewess to give a public performance of yet another contemporary dance production called “Body Motion” at the Manoel Theatre. 2007 saw the beginning of the presidency of Mrs Ingrid Kidder who thus became the first German and the first female to lead our Association. 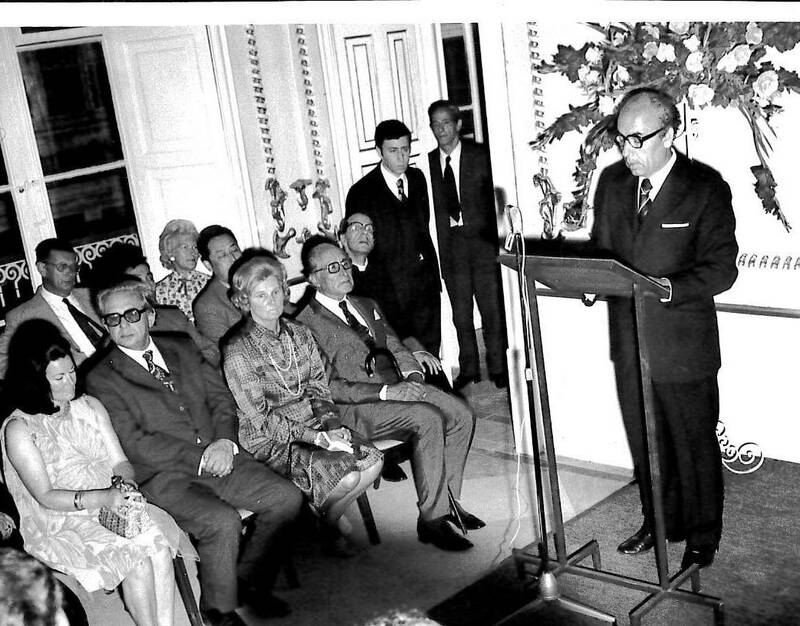 The German-Maltese Circle celebrated its 45th Anniversary in 2007 which event culminated with the visit of the President of the Federal Republic of Germany, Prof. Dr. Horst Köhler to Messina Palace where he met German Nationals living in Malta. The German-Maltese Circle in collaboration with the Goethe Institute organised the First Festival of German Films at St James Cavalier in Valletta in 2009, an event which continues annually with great success. That same year, the German-Maltese Circle was licensed as a Prüfungszentrum des Goethe Instituts, with the consequence that all Goethe Institute examinations became available in Malta. Our Association took a leading role in the organisation of the Education Fair “Welcome to German!” which was held at the Maria Assumpta Girls Secondary School in Hamrun in October 2010. This event, held under the patronage of the then German Ambassador, H.E.Mr Bernd Braun was visited by over 1000 schoolchildren learning German in schools in Malta and Gozo. 2012, saw the election of Ing. Arthur Ciantar as the German-Maltese Circle’s seventh President as well as the celebration of the Association’s 50th Anniversary. Many events were organised for the occasion with the highlights being a contemporary dance performance choreographed by Irina Pauls at St George’s Square in Valletta and a concert at the Sir Temi Zammit Theatre by the Kölner Mandolinorchester “Harmonie” conducted by Sergei Kurdiaschow.